I grew up as a child in the 80's and 90's. I love my mom dearly but she wasn't much of a photo taker. I do have photos from my childhood but not many and some of them don't coincide with childhood memories that I want to document. Fast forward to today...if you were to walk into my home today you would find bookshelf, after bookshelf, after bookshelf filled to capacity with books, mostly children's books. My daughter was estimating the other day that we have somewhere between 500-550 books in our house. A lot of these books I have purchased at thrift stores. We probably spend $5.00-$10.00 a week at the thrift store buying children's books. I love digging through the piles of old books and finding books that I remember reading as a child. Those are the books that I always buy. While spending time going through my grandparents photos for the "restoring old albums into pocket page scrapbooks" I've been asking myself a lot of questions about my memory keeping. Am I documenting the stories that my kids will remember and that they will want to read when they are grown? Are the memories that I'm documenting the ones that they will be excited to share with their children? Am I taking photos of the events that they will want to remember? I realized that there are memories from my childhood that I want to record even though there aren't photos to go with these memories. One of those memories is of being read to as a child. My mom is the queen of reading. She's the one who has given me and my kids the book reading (and collecting) obsession. I used the October Afternoon Public Library collection. I may have purchased the entire line...duplicates on some things. So, be prepared to see a lot of projects with this collection. 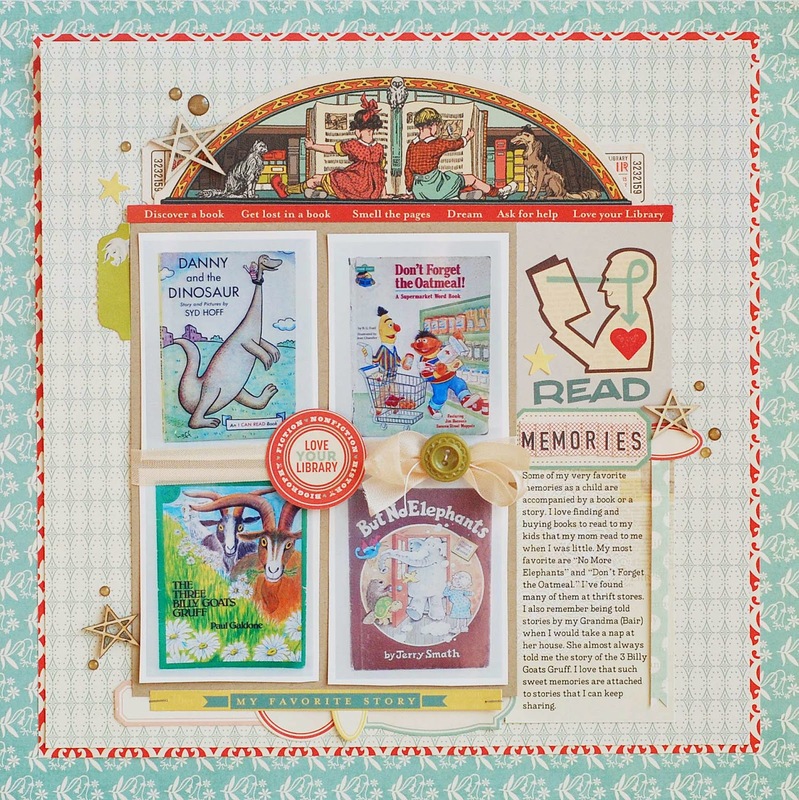 I love the sticker titled "my favorite story" I knew I wanted it on this page but I was struggling to find a spot for it where it didn't get lost in the other elements of the page so I created a base for it using pieces of label stickers. 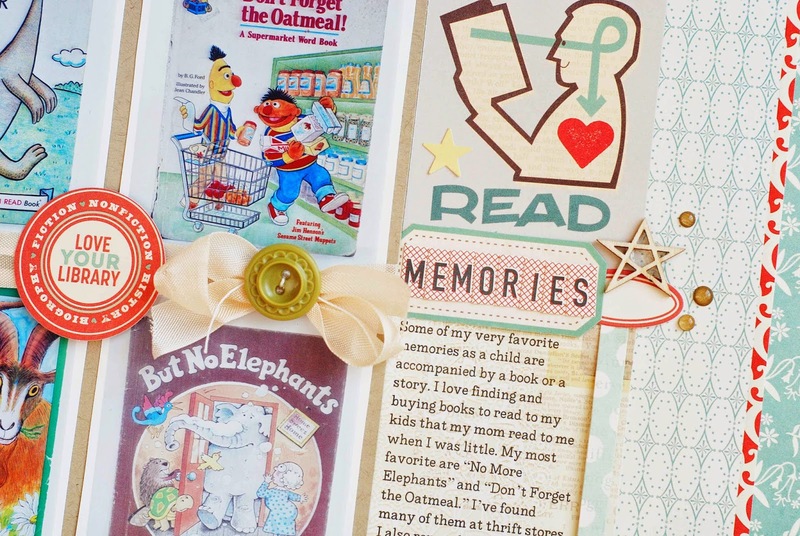 Some of my very favorite memories as a child are accompanied by a book or a story. I love finding and buying books to read to my kids that my mom read to me when I was little. My most favorite are “No More Elephants” and “Don’t Forget the Oatmeal.” I’ve found many of them at thrift stores. I also remember being told stories by my Grandma (Bair) when I would take a nap at her house. She almost always told me the story of the 3 Billy Goats Gruff. I love that such sweet memories are attached to stories that I can keep sharing. This week I hope you will think about and hopefully document some of your childhood memories. Even if you don't have photos or can't take any photos. Get those memories written down! Tomorrow the 3rd and final part in the series "Restoring Old Photo Albums into Pocket Page Scrapbooks" will be live. Make sure you stop by and check it out. I love this layout! So sweet and such a great thing to document! I'm pinning it! 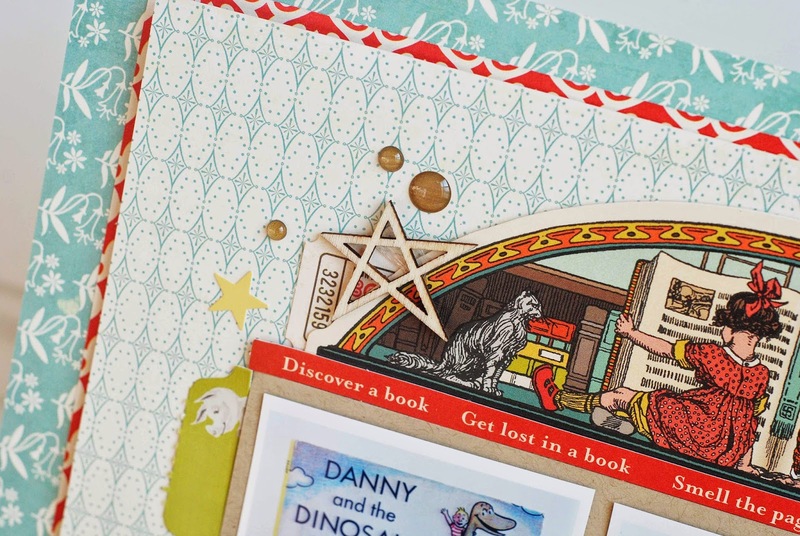 I LOVE this, from the colors to the books chosen, and that READ symbol!such a great project and a wonderful thing to scrap! some SERIOUS faves here! 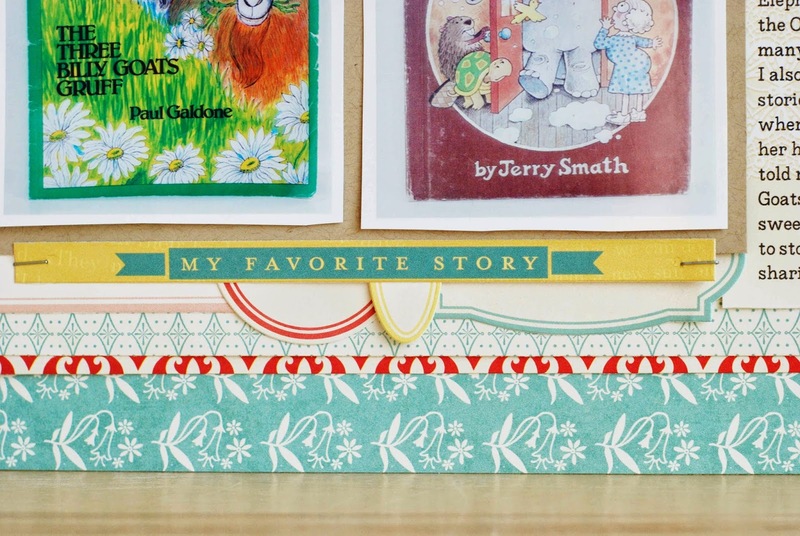 love the theme of this page and i could TOTALLY see an album full of childhood things just like these books!! awesome, Becki! Gorgeous Becki!! and what a fun idea!! Going to pin this too! !